"Ode-to-Napoleon" hexachord in prime form One of Babbitt's six all-combinatorial hexachord "source sets". Play . The principal forms, P1 and I6, of Schoenberg's Piano Piece, op. 33a, tone row Play feature hexachordal combinatoriality and contains three perfect fifths each, which is the relation between P1 and I6. 1 2 3 Whittall, Arnold. 2008. 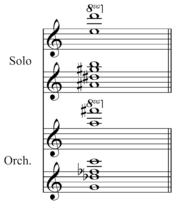 The Cambridge Introduction to Serialism. Cambridge Introductions to Music, p. 272. New York: Cambridge University Press. ISBN 978-0-521-86341-4 (hardback) ISBN 978-0-521-68200-8 (pbk). 1 2 Christensen, Thomas (2002). The Cambridge History of Western Music Theory, [unpaginated]. Cambridge. ISBN 9781316025482. 1 2 Van den Toorn, Pieter C. (1996). Music, Politics, and the Academy, p.128-29. ISBN 0-520-20116-7. ↑ Castaneda, Ramsey (March 2016). "All-Combinatorial Hexachords". Retrieved 1 June 2016.